Up until now your panel has been a bit delicate and easily harmed. The cementing stage will make it strong and waterproof. A black putty mixture is pushed under the lead came, which hardens to make the stain glass panel firm. Dustpan and brush 8. Newspaper 9. Dust mask. White spirit (UK) = Mineral spirits (US, Canada) = Mineral turpentine (AU/NZ). Generic name = paint thinner. If you’re going to do a lot of lead came panels, it’s cheaper to make your own cement. Otherwise you can buy a pot of ready made black cement at any stain glass suppliers. – The ready made cement has to be mixed for about 15 minutes. It’s easier to take some out and mix it with a strong knife on a board. – To mix your own, get some household putty and knead it until it has no lumps and is malleable. – Put it on your mixing glass/tile and mix in some white spirit (mineral spirits, paint thinner) with the mixing knife, until it’s fairly runny. – You don’t want it too stiff otherwise it’s difficult to push it under the flanges of the lead. – When it’s mixed together, add a spoonful of black powder paint to colour the putty black. – Place your panel on some newspaper. – Using either an old toothbrush or a scrubbing brush, start pushing the cement under the leaves of the lead. Plastic nail brushes are great for this. Work the cement in across the leads. If you brush up and down the length of the lead you will remove the putty you’re trying to put in. – Don’t worry if you get more black cement in one side than the other, it’s normal and adds to the texture of the panel. – If you have enough time, it’s best to cement both sides at once and clean up afterwards. – You can do one side at a time as long as you clean it thoroughly before stopping. If you leave the cement on too long it starts to harden and is difficult to clean off the lead came. – Scrape away the excess cement with the fid. This can be reused if sealed tightly in your putty pot. -Use the flat end of the fid and gently push down each side of the lead onto the glass. – You can break your glass at this point, so don’t push too hard. – Don’t worry too much with this if you’re using narrow lead – 3/16 (5mm) – as there’s not enough width to push down. – Sprinkle with whiting (chalk dust) and rub over the whole panel so the chalk dust absorbs the linseed oil. – Trace round each glass shape with the ‘beak’ of the fid to loosen the spare cement. – With firm pressure, brush this spare cement off with a scrubbing brush. If you can find one with short bristles they work very well. As above, brush across, not along the length of the leads. – Make sure you get all the putty off the lead came before it hardens and becomes tricky to remove. – Turn the stain glass panel over and do the same on the other side. – Some of the putty will squeeze through, but don’t worry as you are yet to do the final clean. 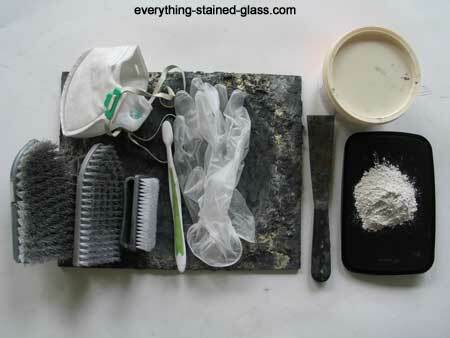 – Once you’ve cleaned all the leads and glass with the whiting you’re finished for now. 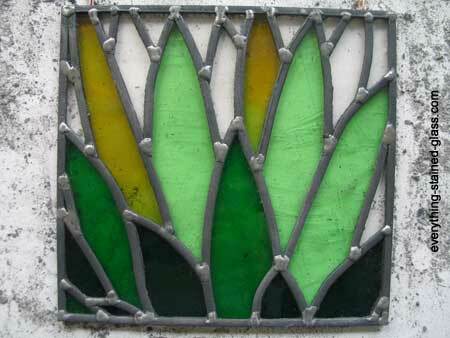 – Leave the stain glass panel for about three days so that the cement can dry and harden. – Usually the cement is a bit runnier than this. – Using a knife isn’t recommended, as you might scratch the glass and it’s not very flexible for pushing the cement. But all the same, it might be helpful and give you some idea of the process. Once your panel has dried for 2-3 days you’re ready for the final stage Cleaning and Polishing. I want to patina the lead cames within my panel and the zinc came framing the edges. Should the patina processing be done before or after puttying? After. The puttying is messy and needs a lot of cleaning up. Once the panel is cleaned and picked out you’re ready to patina. I hope that helps. I live in a Central American country where glass supplies are not readily available. Cementing glass is a challenge because of the materials we DON’T have. It has been suggested that plumbers putty will work. It is pliable and fairly easy to apply but I would like to make it a bit more liquid and black. It is a light tan color and it does not harden. Can you suggest what I might mix with the putty to make it easier to apply and color? Thanks. White spirit/Mineral spirit. Try to get the odourless type, it’s less harmful to your lungs. You can use powdered poster paint to make the putty black. I hope that helps Steve. What are the health cautions in working with the cement and the whitening? Indoors or Can it be done in cold garage 40 degree damp garage? You need to wear a mask to prevent breathing in dust particles. The cold garage is fine; the cement will just take longer to set. Good questions, thanks Jean. So far I’m reading cementing textured glass the best thing to do is to mask off most of the glass so cleaning won’t be a nightmare. Any further suggestions? If I mix my own cement, does the glass need to start out dry? I just washed it and ready to start cementing. Hi Laurie. Yes, they have to be totally dry before you cement them. I never wash my leaded stained glass panels. I clean the glass and lead with brushing whiting all over the panel. I hope that helps. As usual your Instructions are detailed and great! Thanks Mitzi, glad you find the tutorial helpful.